Farms and ranches are closely related, as they are both places where food is grown. A farm is generally any place where agriculture is done. This means that it can be any place where a living thing that provides a resource, such as a plant that provides food, is planted or raised so that the resource will be available more often than it would be if people had to find it in the wild. There are many kinds of farms, and many things that can grow on a farm. Plants, animals, and fungi are the main types of living things that can be there. The things gathered from a farm generally fall into one of four groups: food, fibers, fuels, and other raw materials. Foods are basically anything you eat, from grains to spices. Fibers are anything that can be used to make cloth, such as cotton, wool, silk, flax, and hemp. Fuels – more specifically, bio fuels – are often made from ethanol that is extracted from plant matter. Some types of corn are especially popular for that. The other raw materials are usually things used to make other things, like rubber plants, trees for lumber, resins, dyes, chemicals, and so on. Farms tend to be larger than the average house. A small backyard garden would not count as a farm. The word ‘farm’ can also mean any plot of land that is dedicated for the purpose of agriculture. Outside of that, it can be a place where a lot of similar structures are used to collectively provide something. For example, a wind farm is a place where you will find a lot of wind generators. A server farm is a place where a lot of internet servers are kept. ‘Farm’ can also be a verb. It describes the act of working on a farm. A ranch is a specific type of farm. It is usually a very large farm where the most common products – or the only products – are animals. However, it is usually not used for fish farms. This word is most often used in North America. It comes from the Spanish word ‘rancho’, which meant a small farm meant for vegetables or livestock. Over time, the meaning changed. Ranches are usually extremely large, though the western United States may still use the original meaning. Like ‘farm’, ‘ranch’ can also be used as a verb to describe the act of working on a ranch. Other types of farms include orchards, which are farms which mainly grow trees that produce food. These are usually the types of trees that produce fruit, but they can also produce vegetables and nuts. There are also fruit gardens, which are smaller and tend to grow shrubs instead. Hydroponic farms are places that grow plants in water. There is also the related aquaponic farm, which combines growing plants in water with another type of creature – usually fish – to create a symbiotic relationship that leaves both the plants and the fish healthier. If farms only produce a single thing, then they are usually named by the type of thing they grow. For example, a pig farm or pig ranch will mainly raise pigs, a fish farm will raise fish, a corn farm grows corn, and so on. If they grow more than one thing, or mainly grow a mix of crops, then they will usually be called something generic, like just a ‘farm’. 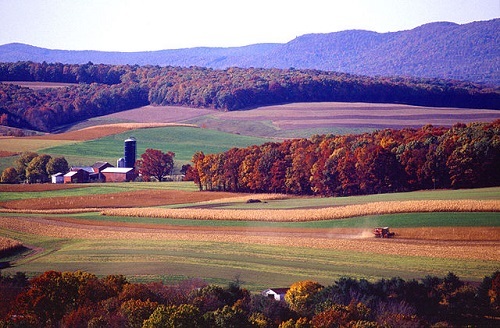 To summarize, a farm is a place that grows crops or raises livestock in order to collect resources from them. A ranch is specifically a large farm where the main product is livestock. It comes from the Spanish word ‘rancho’, which meant a small farm, but the meaning has since changed. Kianna. "Difference Between Farm and Ranch." DifferenceBetween.net. November 8, 2018 < http://www.differencebetween.net/language/difference-between-farm-and-ranch/ >. As a young boy we lived on 16 acres with over 60 citrus trees and usually a dozen hogs.and my parents.always called it a ranch.